The gameplan for navigating Kathmandu works out to something like this: to get from Point A to final destination Z, you’ll first need to take a left when you reach Chowk B, and keep driving until you reach maybe a corner kirana store or a peepal tree; you’ll then have to turn right and head towards the yellow house in the vicinity; and from there you’ll want to look for a house with a blue gate. When they started out, Foodmandu were afraid Kathmandu’s chaotic layout would get reflected in a chaotic operation they could ill afford. So at the end of 2010, when GPS was a fairly new concept and 3G non-existent in Nepal, Foodmandu had to train their delivery personnel about various locations by taking them to all the places inside Kathmandu carrying with them a binder of printed maps and a bar phone. A new delivery recruit would need to not only know the city inside out, he would also have to trawl Foodmandu’s coverage area for weeks, etching into his mindscape the endless alleyways, newly plotted colony streets and obscure local landmarks. Today, however, that mapping process is less gruelling, as the company has changed with the changing technology and is making use of GPS tracking, marshalling smartphone navigation systems and staying on the ball with instant-delivery notifications. After six years of operation, Foodmandu’s basic purpose has remained the same: They still only provide food delivery service and nothing more. But over the years, the way that they do it has evolved by leaps and bounds. 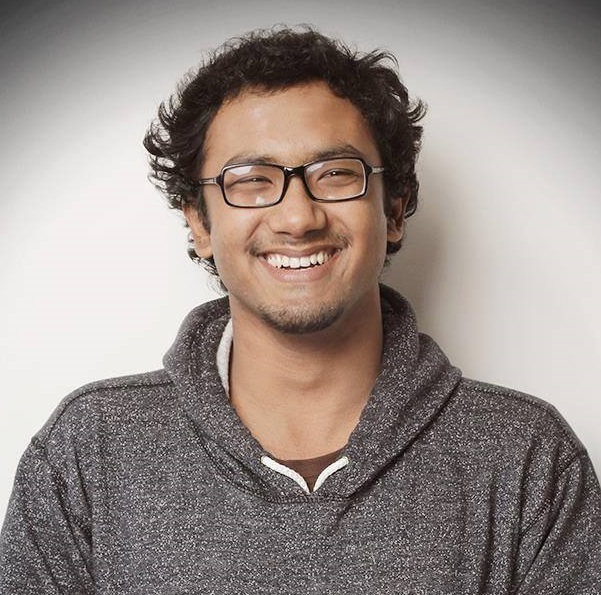 When Manohar Adhikari, CEO of Foodmandu, decided to commit to his concept of Foodmandu—with his business partner at the time, Yubraj Prasai—he operated the company from the corner of a small room in his software company, Sturdy Software. Apart from the two cofounders, the company only had two customer-service and two delivery staff. 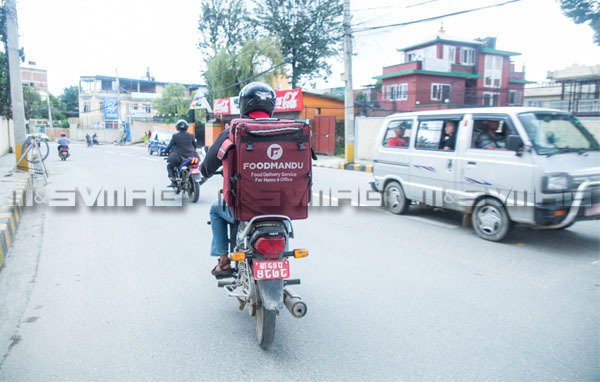 Today, the company employs 40 people, including 23 delivery staff, who work out of a three-storeyed buildingin Baluwatar, and deliver food from over 130 restaurants around Kathmandu to their ever-expanding pool of customers. Regardless of the growth in scale, the company’s revenue model has remained the same: Customers can order food—either online through their website, or by using their mobile app or through a telephone call—at menu price from Foodmandu’s partner restaurants; the company receives a small percentage as commission from the restaurants and charges a nominal delivery price on the customer, depending on their location and the total value of the order. In 2010, the company mostly made lunch deliveries to various offices—especially banks—lining the Hattisar lane. The restaurants themselves—Foodmandu started out with 10—were located in and around Hattisar, Baluwatar and Durbarmarg, and the deliveries were only made to places within a two km radius of Hattisar.The idea to target employees, specifically during lunch hours, had come to Adhikari as a possible solution for his own lunch-related problems. When he was working at D2Hawkeye, in Bishalnagar, as a software developer some five years before starting Foodmandu, going for lunch was for him quite a difficult proposition. He and his colleagues had to walk 10 to 15 minutes just to find decent eateries, place their orders, wait for their meals, have their lunch and then walk back to the office again, all within their hour-long lunch break. It was an ordeal many at the office wished they didn’t have to undergo every day. They knew that a food-delivery service would make a huge difference, and so did Adhikari. “It was not about coming up with an idea for a business,” he says. “It was about finding a solution to my own problems.” He had mulled over the delivery-service idea for years, and since no other company was providing any such service at the time, he decided to give it a shot. He believed that when Foodmandu was launched, talk about the services would spread like wildfire. When the company finally got off the ground, Adhikari asked his staff to go easy with handing out the first batch of 500 promo flyers. “I wanted limited promotion,” says Adhikari. “I didn’t want people to order more than we could deliver.” But for the first six months, Foodmandu received barely three orders a day. But then things started to pick up. He also realised that although most orders were placed by offices, there was a demand for the service among individual customers too. 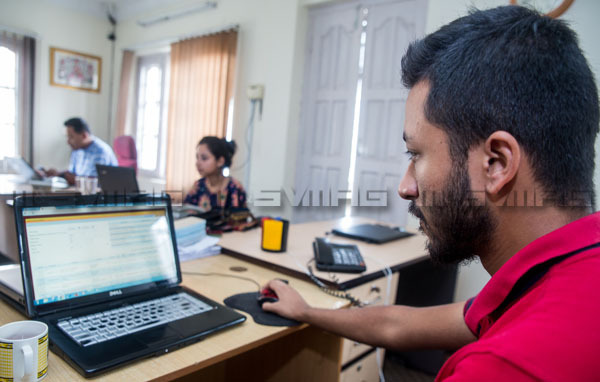 As word spread, Adhikari decided to extend his services: The delivery hours were stretched till eight in the evening, and instead of delivering only on workdays, the company took orders even on Saturdays. Today, Foodmandu gets orders worth over Rs 150,000 every day. To ensure that the increasing orders were fulfilled on time required that Adhikari get more vehicles for delivery. In the beginning, Adhikari had opted for using two electric scooters to make deliveries—they were economical, priced at around Rs 35,000, and eco-friendlier than motorbikes. However, Adhikari soon realised that the scooters couldn’t cover the distance as they had been pegged to, and with an average of 25 kilometres of drive-time on a single charge, they weren’t nearly reliable enough to make regular deliveries. Replacing the e-scooters with used motorbikes meant a major re-investment that Adhikari had not anticipated. “We had to learn that regular re-investments were a major part of a startup’s lifecycle, especially for a company like ours,” says Caesar Shrestha, Foodmandu’s business development executive. For instance, if the company regularly get an additional 50 orders, they have to hire a new full-time delivery person and purchase a brand new motorbike (the company stopped purchasing used bikes two years ago because of maintenance issues with them). And according to Shrestha, Foodmandu only stopped incurring operational losses after 2015, but the company still hasn’t made profits because of the losses it has accumulated over the years. As with most companies, the loss incurred was especially high last year. “First, the earthquake resulted in a decline in orders, and then the fuel crisis hit us hard, as it was difficult to make deliveries,” says Adhikari. The company took fewer orders during the monthslong fuel crisis, even as the deliveries cost them almost five times the usual amount. However, despite the challenges, continuing operations during the crisis led to the company’s not only retaining customers but also gaining goodwill and trust, which from their experience, they know can be hard to attain. In the first few years, because the concept of e-commerce had not gained popularity, prospective customers hesitated to place their trust in the company, and thus to make use of Foodmandu’s service. 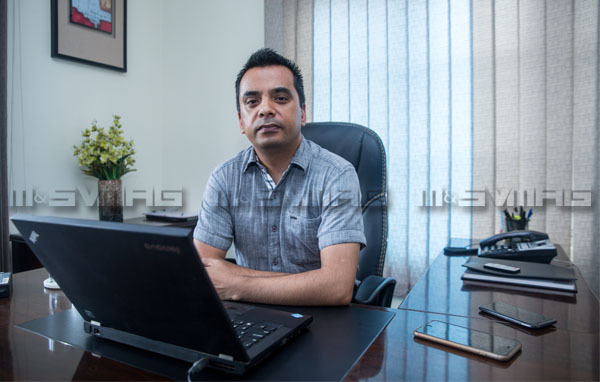 “The problem stemmed from Nepali e-commerce businesses’ inability to assess the local market and identify the problems faced by local customers,” says Adhikari. For Foodmandu too, initially, almost 70 per cent of the orders came from the expat community, who were more familiar with online businesses. Although expats and tourists make up a large chunk of the company’s total customer base even today, there is an equal proportion of Nepali customers using the service now. One of the main reasons Nepalis gradually started trusting Foodmandu, believes Adhikari, had to do with the company’s payment system for the services. “Cash-on-delivery is still the only means of payment for Foodmandu’s services,” says Shrestha, “because Nepalis are still reluctant to use online payment gateways.” Cash-on-delivery, along with the company’s encouraging direct feedback from their customers, has also provided Foodmandu with a way to address the unique needs of Nepali customers. But apart from their decision of not implementing online payment services, Foodmandu has usually been very quick to adopt technological advancements. The company has been using GPS vehicle-tracking software to help with logistics for a few years now, and they also make sure all their delivery staff have smartphones, on which they can get notifications of new orders, along with a map of the delivery points. Adhikari does, however, regret not coming up with a mobile app sooner— the company only launched their mobile app last December. “Mobile applications are a great way to not only provide better service to customers, but also help increase company visibility and boost the frequency of orders, ”says Adhikari. Even before the company launched their app to the public, during the beta-testing phase, they had already received orders from customers who had searched for and downloaded the app of their own accord. “All the changes we have made are meant to provide highest-quality service to our customers,” says Shrestha. 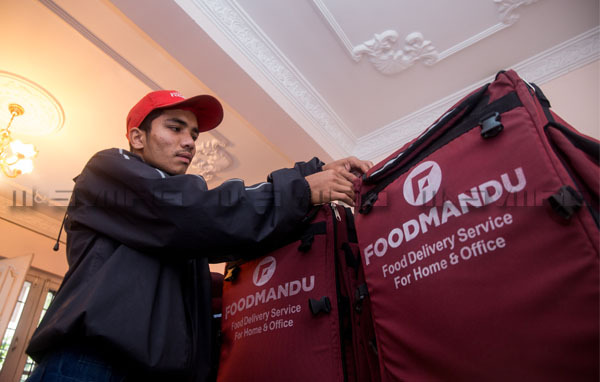 “They have largely been based on trial and error, especially when it came to our thermal delivery bags—to deliver hot food to the customers.” The large square black bags that Foodmandu is identified with today represents the eighth reiteration of the company’s packaging paraphernalia. After iceboxes were deemed ineffective, the company designed a number of bags over the years with the help of local bag manufacturers— to have just the right amount of insulation to them. At one point they even bought Styrofoam fish-delivery boxes from Teku, cleaned them up and encased them inside aluminium sheets, to hold in the heat better. But the bags seem to have hit the sweet spot. It’s these little changes in how they do things that have kept the company evolving. Now the company, rather than expanding its reach, is mainly focusing on fine-tuning operations and further bettering the quality of its service—such as providing English language and delivery etiquette training to delivery staff, and upgrading the company website and the recently launched Foodmandu app.